Brooklyn U.S. District Judge Pamela Chen has ordered that the NYPD must turn over documents related to it’s undercover spying operations that targeted Muslims. The ruling came as a result of an ACLU case, brought by a number of individuals, mosques, and a religous based non-profit group in the aftermath of a series articles by Associated Press writers Matt Apuzo and Adam Goldman. The work by Apuzo and Goldman to expose NYPD undercover activities was the basis of their recent book Enemies Within: Inside the NYPD’s Secret Spying Unit and bin Laden’s Final Plot Against America. The book, along with the articles, also exposed NYPD’s efforts to spy on and undermine anarchists and other like minded social justice activists. Much of their revelations were made possible thanks to secret internal NYPD documents that outlined what undercover officers where doing. Many of these documents were published shortly after the book was released and include details about both surveillance of Muslims and activists. 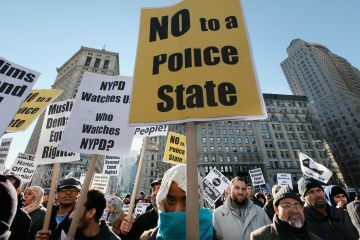 The NYPD has two months to turn over the requested documents which are likely to reveal even more about who and how they obtained information from within both Muslim and activist communities.